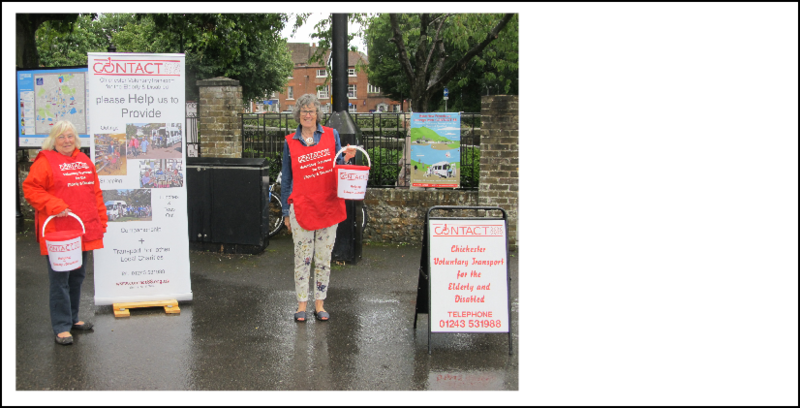 A brave team of helpers faced mixed weather and used a variety of methods to extract cash from the general public in support of Contact88 on 19 August in Chichesters’ Northgate car park. Just under £250 was raised on the day. Bernard Charles, Co-Founder and President of CONTACT 88, died peacefully on 16th May 2017 after a short illness. In retirement, Bernard became a volunteer driver for the West Sussex Association for the Disabled. But soon he conceived a more ambitious scheme to bring the elderly and disabled people of Chichester together through regular outings. 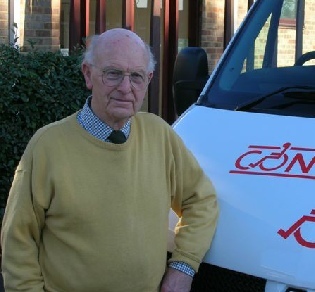 With the help of David Nutting, his ideas evolved into CONTACT 88, which next year will celebrate 30 years of charitable status and service to the Chichester community. In due course Bernard was able to leave the ongoing management of CONTACT 88 to a committee of volunteers. But as President he continued to contribute to its success with wisdom, ideas, and energy. Even during the last days of his life he was adding the finishing touches to a new and evocative CONTACT 88 poster. Bernard’s achievements at CONTACT 88 are but one facet of his remarkable legacy. His tireless resourcefulness and unsparing kindness will be fondly remembered by all who knew him and in particular by those who were privileged to work with him.